» On the waterfront beat: Look up, a cow! 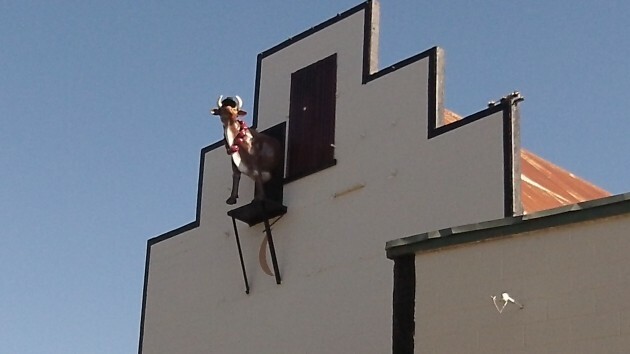 On the waterfront beat: Look up, a cow! Is it art or architecture? Neither, it’s Elsie! People walking or riding along Albany’s riverfront Dave Clark Path now have a couple of helpful new clues about the background of one prominent old building there. It had something to do with cows. Yes, you got it: milk. The structure was known as the Borden Building when it had something to do with the dairy business back in the day. It housed the local branch of the Borden Milk Co. In March this year, building owner John Boock got approval of a $4,500 grant from the Central Albany Revitalization Area to cover half the cost of repairing and painting the exterior of the Borden Building’s “tower.” Another part of the property houses the DeLuxe Brewing Co., and Boock told the CARA board that a cosmetic upgrade of the tower would help revive the area. The east wall is no longer a blank slate. Now part of the structure has been repainted and otherwise dressed up. More than that, a rendition of Elsie the Borden cow emerges from the gable, drawing the eyes of passersby skyward. 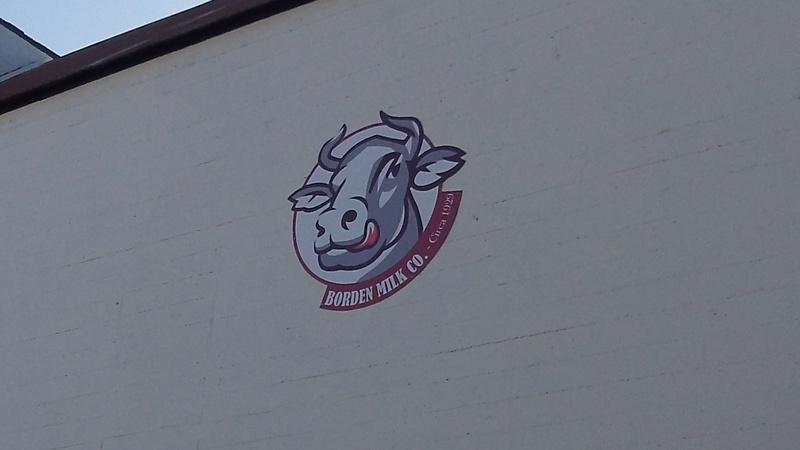 And the east side features, high up on the wall, another view of Elsie in the Borden logo. There was no pirate action – nothing was stolen from anyone. Your statement is factually false. The decision to grant the money was done in public in the full light of anyone wanting to know about it, and it was done in accordance with the laws of Oregon and the City of Albany. The building looks better and it adds a little whimsy to the town. The waning moon is in reference to the cow jumping over the moon, I believe. Also at one time I was acquainted with an employee of the Borden Co. and stopped by one night to chat and was shocked. Thousands of cans moving along a belt which stopped periodically so he could change labels. Yep, Borden, Carnation, Pet, etc all came through the same line. IF you look at the “ESTxxxxx” number on packaged meat, that’s the same “factory” as another brand with the same number.